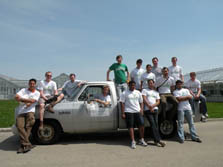 The Illinois team outside its temporary construction and testing site following a day of work on footings, decking, and siding for its Solar Decathlon Gable Home. Gable Home incorporates architectural features common in the Midwest. After the 2007 Solar Decathlon competition, the Illinois team set out to prove that the best new energy technologies could still look like a real home. 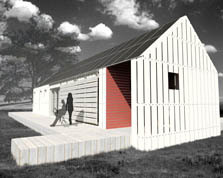 Its Gable Home produces up to four times the energy it needs, yet looks like a traditional home. It has 100-year-old barn wood and high-efficiency solar panels on the outside and features a familiar gable roof profile. Inside, the newest structural bamboo and optimized windows, insulation, and appliances mean it can be heated with a single hair dryer. More than 200 people worked—from performing energy calculations to checking out products to helping out on work days—on Gable Home. "I enjoyed the collaboration and just talking to people on campus that we don't see otherwise," says architecture student Joe Simon. The team set out to prove that there is "no schism" between new technologies and traditional ways of building houses. "Our whole process has been a back and forth to find relationships between vernacular or traditional styles of housing and new technologies," says Simon. The team really wants Gable Home's innovations to reach consumers. It is working with a builder of modular homes to make this more than a one-of-a-kind project. The gable roof line is common in Midwestern agricultural areas. The barn wood siding, barn door-like sliding shade structure, and decking made of reclaimed wood from a grain elevator echo traditional home features. Rather than having a single flat roof facing south for maximum installation of solar panels, the gable design presents half of the roof to the south. "We hope this proves that solar panels are efficient enough to get the electricity you need," says student Camden Greenlee. Solar panels that generate up to 9.1 kW of direct current power, which is converted to alternating current for use in the house.